Well, friend. We told you--over and over again--that the zombie apocalypse was about to begin. And did you listen? Nope! No you didn’t. So, no, we’re not really surprised to see this undead partygoer crawling out of your grass. Oh, wait. Hang on. That is just a really frightening looking zombie decoration popping out of your yard. Whew! You even had us fooled. Sorry, we really thought it was real for a second! Well, we are happy to know the apocalypse isn’t imminent (yet), but we are also really impressed by this Skull on Jaws! We mean, WOW. 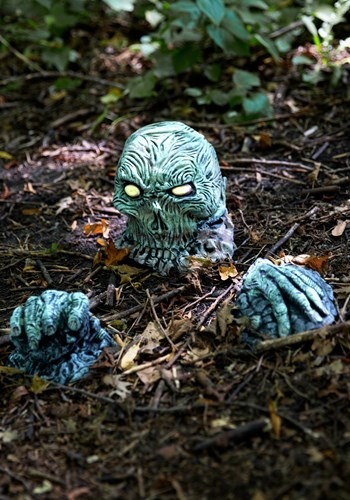 That truly looks like a gruesome zombie is clawing its way out of your lawn to eat our brains. Actually, we may need to get one of these...maybe when the real zombies come they will assume we’ve already joined their ranks if they see this out in the garden. In fact, maybe we’ll get two.